Welcome to Palestine Today, a service of the International Middle East Media Center, www.imemc.org, Thursday, September, 08, 2016. Israeli troops injuries a teen and attack fishermen in Gaza and another teenager is also injured by Israeli fire in the West Bank. These stories, and more, coming up, stay tuned. Israeli soldiers stationed on military towers across the border fence in Gaza, shot and injured an 18-year-old Palestinian in Abu Safiyya area, east of Jabalia, in the northern part of the coastal region. No further details about the circumstances of the incident were available until the time of this report. Later on Wednesday, Israeli navy ships opened live gunfire towards Palestinian fisherman off the coast of the central Gaza Strip, and detained five of them after sizing their boat. All five men were taken to unknown location, Palestinian sources reported. The Palestinian Center for Human Rights, PCHR, announced that since the start of 20016, Israeli navy opened fire at Palestinian fishing boats 139 times injuring 24 fishermen and damaging 16 boats. Elsewhere, a Palestinian teenager was injured after Israeli troops opened live gunfire at schoolchildren as they were leaving their school at the al-Jalazone refugee camp in the central West Bank city of Ramallah on Thursday. The boy was moved to a local hospital. Witness said that there were no clashes in the area and the soldiers opened fire without any provocation. Also on Thursday, The Palestinian Prisoners Society (PPS) has reported that Israeli soldiers have kidnapped, on Wednesday at night, and earlier on Thursday, seventeen Palestinians, including two children, in the occupied West Bank. 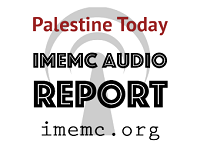 And that’s all for today from the IMEMC News; this was the Thursday, September, 08, 2016, news round-up from the Occupied Palestinian Territories. From more news and updates, please visit our website at www.imemc.org Today’s report has been brought to you by George Rishmawi and me Ghassan Bannoura.